The District Grand Lodge of Mark Master Masons of Jamaica (hereinafter styled District Grand Lodge) shall meet annually on the 4th Saturday in June and shall also meet on such days and at such times and places to be appointed by the District Grand Master. The District Grand Lodge having been opened, these By-Laws or such of them as shall be decided by vote of the majority of members present may be read. The District Grand Treasurer shall be elected. District Grand Officers shall be appointed and invested. A Committee of three members shall be elected to audit the District Grand Treasurer's accounts; Two to form a quorum. A Committee of three members shall be elected to examine and report on the condition of the property of the District Grand Lodge; Two to form a quorum. 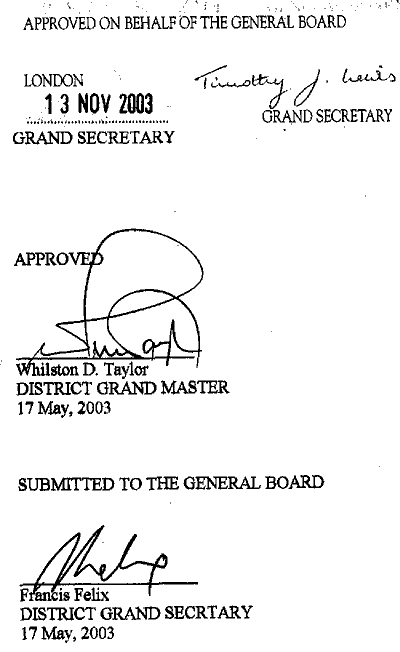 Reports of Committees and such other matters as the District Grand Master shall direct will be given attention. The District Grand Treasurer shall not pay any claim or account without the sanction of the District Grand Lodge or the District Grand Master. He shall keep a record of all contributing members of Lodges showing the amounts remitted to him on account of each member in each return rendered by the Lodges. The District Grand Secretary shall issue summonses for the meeting of the District Grand Lodge fourteen days before such meeting; take minutes of the proceedings of such meetings; keep a register of the brethren in the several Lodges in the district, noting the date of advancement or joining of each brother and also a list of the Masters, Wardens, Overseers and Past Masters in every Lodge. He shall also perform such other duties as may be assigned to him from time to time by the District Grand Master or District Grand Lodge. The District Grand Tyler shall attend all the communications, Committees and Visitations of the District Grand Lodge. He shall be responsible for the safe custody of and produce for inspection when required the property of the District Grand Lodge and shall perform all such duties as may be prescribed by the District Grand Master or District Grand Lodge. His remuneration shall be fixed by the District Grand Lodge. If any District Grand Officer joins the District Grand Lodge meeting after the hour named in the summons and after another brother has been appointed to act for him, he shall lose his right to act as a District Grand Officer for the meeting unless the District Grand Master or Officer presiding otherwise decide. The Mark Benevolent Fund shall operate as per the Rules annexed to these By-Laws as scheduled 1.
on appointment to an office or rank for which the same or lower fee is appropriate he shall pay no further fees. Unless the brother who has been appointed to an office has signified his acceptance thereof to the District Grand Secretary the return prescribed, has paid his dues to his Lodge to the 31st of August of the preceding year and paid the prescribed Fee of Honour, the appointment shall lapse and a new appointment shall be made to the office. The Master of every Lodge in the District shall on or before the first of February in every year transmit in duplicate to the District Grand Secretary the return prescribed by Rule 101 of the Constitutions and Regulations together with all monies payable to the District Grand Lodge, and shall also on or before that date make a return to the District Grand Secretary as required by Rule 102 to be made to the Grand Secretary. The Master of every Lodge shall send to the District Grand Master at least one month before the installation meeting of the Lodge a short report of its proceedings during his year of office containing such information as will show the condition of the Lodge. The District Grand Registrar or the District Grand Secretary when directed by the District Grand Master shall examine the books of any Lodge in the District and report thereon to him. All communication to the District Grand Master or to District Grand Lodge shall be addressed to the District Grand Secretary. A copy of the summons for every meeting of a Lodge in the District shall be forwarded by the Secretary to the District Grand Master, the Deputy District Grand Master, the Assistant District Grand Master and District Grand Secretary. Applications for Grand Lodge Certificates are to be forwarded to the District Grand Secretary as soon as possible after advancement of a brother or the joining of a member from another recognized Constitution. All matters of business which a member of the District Grand Lodge wishes to be brought under the consideration of District Grand Lodge shall be communicated to the District Grand Secretary at least 45 days before the meeting of District Grand Lodge so that all the representatives of the Lodge may be appraised of such business and be prepared to decide thereon. No other matter shall be discussed in District Grand Lodge without the express permission of the District Grand Master. Any alteration or amendment of or addition to these By-Laws shall be made by motion in writing at the regular communication or at a Special District Grand Lodge convened for the purpose (and confirmed at a subsequent regular communication or at a Special District Grand Lodge) but shall not be valid until approved by the District Grand Master and by the General Board. The above By-Laws were approved at the Annual Communication of the District Grand Lodge, held on the TWENTY EIGTH day of JUNE, ONE THOUSAND, NINE HUNDRED and NINTEY FOUR, and approved by the General Board on March 10, 1995. Amendments to Rules 7 and 9 were approved by the Emergency Communication of District Grand Lodge held on March 17, 2003.